I LOVE Watkins Vanilla!! Seriously, this is WAY better than the vanilla my mother used to use (Sorry Mom!!!!). It always smelled so medicine like to me. 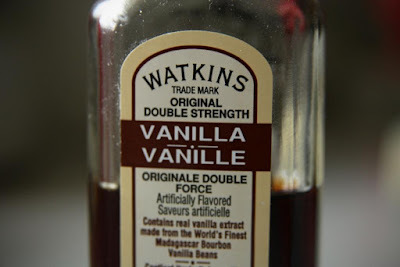 Watkins vanilla smells like, well, vanilla. Today was grocery shopping day and I happily strolled down my favorite Walmart isle- the baking isle. (How many of y'all LOVE the baking isle, too?). I reached up to get my beloved Double Strength Vanilla and it was not there!!!! I just made chocolate chip cookies tonight and there are 2 tsp less vanilla in my cute little bottle. OOOOOH!! I hope they restock their shelves soon!! How can I bake without it??? So tell me, what brand of vanilla do YOU prefer??? Watkins is really good...there's nothing like the real thing! I am currently using Tones brand vanilla extract from Sams Club. I have never tried Watkins. I will be making my monthly Wal-Mart run next week and will check it out. Another very good vanilla that I can find at a good price at Target is Rodelle vanilla. I find it similar to Watkins. I use Costco's store brand- Kirkland Signature Vanilla. I'd love to use actual vanilla beans but I'm not independantly wealthy. I also use Tones from Sam's. I have been please with it so far. It is real vanilla and the best value I have found. I use Kirkland Signature 100% Pure Madagascar Bourbon Vanilla. It is really good and I like the price for pure vanilla. I really like Watkins. I also use Sam's brand, but I think I will give Target and Costco brands a try. Watkins is good but Nielsen-Masey Madagascar Bourbon Pure Vanilla Extract is the very, very best you can use. It is not commonly found in Wal Mart, Target, etc. but you can find it at Fresh Market, World Market and nice shops that carry speciality items. 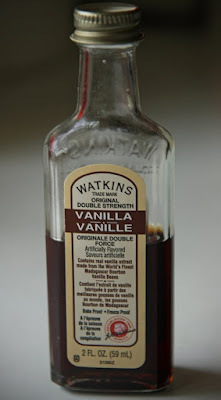 I will not use any other vanilla extract since finding this a couple of years ago. You are more than welcome. The cookbook is Tyler Florence "Dinner at my Place". It has a section for baby food and I was really impressed with it. I will be posting more recipes this week. Did you get my email this morning about the cake recipe? I did get your email about the recipe and I just sent it to you. It is SUPER yummy!! And THANK YOU for asking for it! I had been meaning to link the recipe on my March 23, 2008, post but I just kept forgetting!! Thank you SO much for reminding me!! How can a Christian shop at Walmart?